If you have been following my blog you have heard me talk about growing up as the daughter of a french chef. As a child and young adult, I was raised on the finest of french cuisine and ate at some of the very best french restaurants in the city. All the chefs liked to hang out together, so we would often frequent other restaurants. One of the dishes my dad would like to treat us to was the “Croque-Monsieur”. He would get so excited to prepare this meal for our family and we, of course loved it. I mean who wouldn’t love a ham and cheese sandwich brushed with butter and topped with a béchamel sauce? 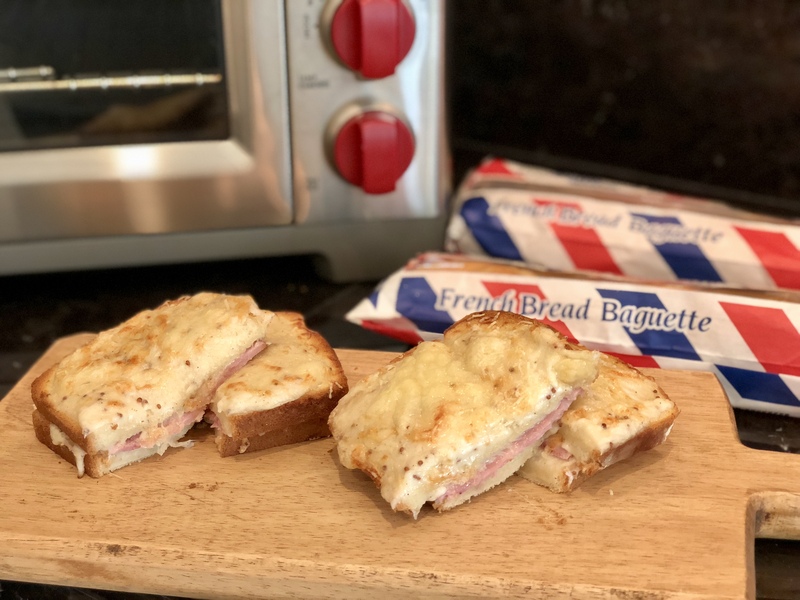 The Croque-Monsieur (translated as “crunch sir”) is considered bar or cafe food in France, along with snacks like tartines and rillettes, salads, and savory tarts. A traditional Croque-Monsieur is prepared as a single layer of French ham and Gruyère pressed between two thick slices of bread. They are then filled and topped with béchamel, which makes the whole dish creamier and better. The bread is brushed with butter, and the sandwich cooked on a griddle, toasted under a broiler, or baked so that the cheese melts and the bits of ham and cheese hanging out the side caramelize. The meal is rich, substantial and salty, and best served with a glass of wine or beer. Begin by making the béchamel. Add flour. Cook and stir until mixture is pale and foamy, about 3 minutes. Gradually add milk, stirring until mixture is smooth. Cook, stirring, until sauce is thick and somewhat elastic, about 4 minutes. Remove from heat and whisk in mustard and nutmeg, and season with salt. Preheat oven to 425° and line your baking sheet with parchment paper. Spread the bread with butter, bottom side down. Then spread bread slices with béchamel, evenly dividing and extending all the way to the edges. Place 4 slices of bread, béchamel side up on a baking sheet. Top with ham and half of cheese. I didn’t have french ham, which is sliced thinner so I used a substitute. Top with slices of bread, béchamel side up, then top with remaining cheese. Bake until cheese is brown and bubbling, 10–15 minutes. I baked the Croque-Monsieur in my Wolf Countertop Oven HERE. I use this oven every single day to toast, bake, heat up and broil food. I also love the convection feature and use it often when I’m in a hurry. The large interior size of the oven is a definite plus too. This oven is definitely more expensive than probably any toaster oven but I feel it is worth the price. Béchamel can be made 1 day ahead. Let cool, press plastic wrap directly onto surface and chill. Sandwiches can be made (but not baked) 1 day ahead. Cover and chill. I cooked 2 sandwiches in the oven and put 2 others in the refrigerator for the next day. My daughter loved this dish, she asked if I could make it everyday! And she is a very picky eater! When she asked me about the little round things, I had to fess up that it was mustard. She got that look on her face, like…I can’t eat this anymore…but then I explained to her that this was good mustard, whole grain mustard…a french mustard like Grey Poupon..not like that nasty bright yellow mustard I dislike as well. Then she looked relieved and continued eating while explaining to me that a lot of mustard is grown in France. Give the recipe a try for your picky eater. Bon Appétit! You can also get daily inspiration by following along on Instagram HERE. Next Post Is it Worth the Money to Hire a Landscaping Company? Hmm…look so cheesy and creamy..so yummy! Yes a very hearty meal for sure! Give it a try Mel!